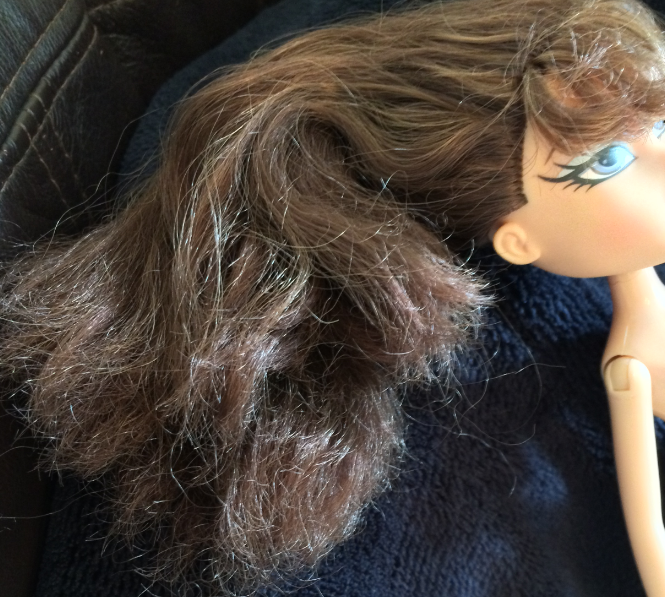 Today's post is about how to revive old dolls. This applies to 'my little ponies' too! The process may be fairly lengthy depending on the condition of the doll. So, you might have some dolls who look a bit like this. Matted hair, stained bodies and faces, dirty clothing... It's all a bit gross. However, I'm going to tell you how to fix dolls that are in this state and make them beautiful again. First, gently remove any stains on the doll's body with a baby wipe or any other non-harsh wet wipe. Try not to get the doll too wet as this can cause damage. Secondly, you want to brush the hair out. This can take quite a long time. Do not tug too hard as this will pull the hair out. Gently brush the hair through, use a gentle de-tangling spray if you need to. I cannot stress how important it is to be gentle with your doll while you do this. Once the hair has been brushed out, it will likely look something like this (beautiful!). It is now when you assess whether the hair needs to be washed or not. This girl definitely needs hers washing and conditioning. So, what you want to do is wet the hair. Avoid wetting the scalp as that can cause all kinds of problems like mould and damp inside the doll. Once her hair is wet, apply a gentle, moisturising shampoo like Dove or Johnsons Baby Shampoo. Do not use shower gel or anything that will dry the hair out as that is the last thing you need. Once you have rinsed the shampoo out with warm water, comb the hair a little. If the hair is dry/damaged like the doll shown above then apply conditioner to the majority of the hair (not the scalp). Leave the conditioner on for between 30 mins and 2 hours. Rinse the conditioner out with warm water. Now, comb your dollies hair and let her hair dry for a couple of hours. Once her hair is dry, you can apply a couple of drops of baby oil and style it how you like! Be very careful with what you apply though. If the hair still looks damaged, you can flat iron it very carefully on a low heat. Only do this if the hair is incredibly damaged though. If the doll's clothes are dirty, hand wash them with gentle soap. Do not put them in the washing machine. These are the results that you should get if you follow this guide! They look so pretty and like new. The whole process took about 4 hours for these dolls, but their hair was incredibly damaged and their clothes were dirty too.